Combina le visite turistiche con gli acquisti in un rilassante tour di un'intera giornata a Giethoorn da Amsterdam. Sali a bordo di un lussuoso minivan e attraversa la pittoresca campagna olandese prima di arrivare a Giethoorn, un pittoresco villaggio considerato uno dei luoghi più espressivi dei Paesi Bassi. Fai a piedi un giro tranquillo del villaggio e poi ritorna ad Amsterdam in tutta comodità del tuo tour. Let me tell you to get to Giethoom. It is worth the trip to see this little village. But it is packed with other tourist too. But go. The problem is taking a large tour versus a small tour. If we had to do it over again I would have chosen a large tour because of cost. Tour is really just a transport to the town. The boat tour is for all visitors so no difference there. Also we were on our own as we walked around. Also, be prepared for a long ride. but the destination is worth it. The town of Giethoorn was the saving grace during this trip. Absolutely charming and beautiful....worth visiting again. However, the driver wasn't the best. It was obvious this was a routine for him and his lack of enthusiasm somewhat tarnished the experience. I recommend going with another company. Giethoorn was amazing village, not as much as you can see coz its quite small. but the house and the view is worth to take this tour. Our guide is very friendly and he always make sure we are enjoying this tour. thoroughly enjoyed this trip, so different from everything else we have seen.Highly recommend this to everybody. Thet tour was excellent. Ben was our tour guide. Awesome tour guide. We drove through the country side of Holland - beautiful views. The village itself was breath taken, Walked the village and did the boat tour highly recommended. We had lunch at "de Rietstulp" excellent. Overall highly recommend. Giethoorn is an excellent place worth visit. Unfortunately, the driver was very unprofessional, keep trying to persuade us to go somewhere he recommend instead of Batavia Stad Fashion Outlet as scheduled even we refused. Then he drove pass the outlet and claimed that he missed the exit and trying to take us somewhere else. Other 2 girls in the same group insisted to go as original plan, so, we lost an hour in traffic. Then the 2 girls just turn up almost an hour late for departure without noticing. The whole group have to wait .......however, I do not blame them as I should have do the same. Completely disappointing to say the least, worst birthday day ever, it was depressing. Giethoorn is beautiful, but the tour itself was not worth the money or time. 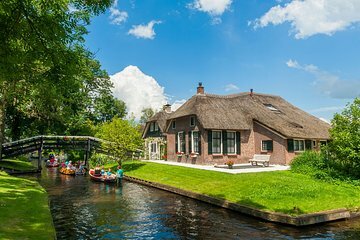 Try going to Giethoorn on your own. I am giving it two stars for the beauty of Giethoorn, the people and the food that was delicious.